The structure of a country’s tax code is an important determinant of its economic performance. A well-structured tax code is easy for taxpayers to comply with and can promote economic development, while raising sufficient revenue for a government’s priorities. In contrast, poorly structured tax systems can be costly, distort economic decision-making, and harm domestic economies. Many countries have recognized this and have reformed their tax codes. Over the past few decades, marginal tax rates on corporate and individual income have declined significantly across the Organisation for Economic Co-operation and Development (OECD). Now, most nations raise a significant amount of revenue from broad-based taxes such as payroll taxes and value-added taxes (VAT). New Zealand is a good example of a country that has reformed its tax system. In a 2010 presentation, the chief economist of the New Zealand Treasury stated, “Global trends in corporate and personal taxes are making New Zealand’s system less internationally competitive.” In response to these global trends, New Zealand cut its top marginal individual income tax rate from 38 percent to 33 percent, shifted to a greater reliance on the goods and services tax, and cut its corporate tax rate to 28 percent from 30 percent. New Zealand added these changes to a tax system that already had multiple competitive features, including no inheritance tax, no general capital gains tax, and no payroll taxes. Some nations, however, have not kept up with the global trend. The United States, for example, has not reduced its federal corporate income tax rate from 35 percent since the early 1990s. As a result, its combined federal, state, and local corporate tax rate of about 39 percent is significantly higher than the average rate of 25 percent among OECD nations. In addition, as most OECD nations have moved to a territorial tax system, the United States has continued to tax the worldwide profits of its domestic corporations. Other nations have moved further from well-structured tax policy. Over the last few decades, France has introduced a number of reforms that have significantly increased marginal tax rates on work, saving, and investment. For example, France recently instituted a corporate income surtax, which joined other distortive taxes such as the financial transactions tax, a net wealth tax, and an inheritance tax. The International Tax Competitiveness Index (ITCI) seeks to measure the extent to which a country’s tax system adheres to two important aspects of tax policy: competitiveness and neutrality. A competitive tax code is one that keeps marginal tax rates low. In today’s globalized world, capital is highly mobile. Businesses can choose to invest in any number of countries throughout the world to find the highest rate of return. This means that businesses will look for countries with lower tax rates on investment to maximize their after-tax rate of return. If a country’s tax rate is too high, it will drive investment elsewhere, leading to slower economic growth. In addition, high marginal tax rates can lead to tax avoidance. A neutral tax code is simply one that seeks to raise the most revenue with the fewest economic distortions. This means that it doesn’t favor consumption over saving, as happens with investment taxes and wealth taxes. This also means few or no targeted tax breaks for specific activities carried out by businesses or individuals. A tax code that is competitive and neutral promotes sustainable economic growth and investment while raising sufficient revenue for government priorities. There are many factors unrelated to taxes which affect a country’s economic performance. Nevertheless, taxes play an important role in the health of a country’s economy. To measure whether a country’s tax system is neutral and competitive, the ITCI looks at more than 40 tax policy variables. These variables measure not only the level of taxes, but also how taxes are structured. The Index looks at a country’s corporate taxes, individual income taxes, consumption taxes, property taxes, and the treatment of profits earned overseas. The ITCI gives a comprehensive overview of how developed countries’ tax codes compare, explains why certain tax codes stand out as good or bad models for reform, and provides important insight into how to think about tax policy. For the fourth year in a row, Estonia has the best tax code in the OECD. Its top score is driven by four positive features of its tax code. First, it has a 20 percent tax rate on corporate income that is only applied to distributed profits. Second, it has a flat 20 percent tax on individual income that does not apply to personal dividend income. Third, its property tax applies only to the value of land, rather than to the value of real property or capital. Finally, it has a territorial tax system that exempts 100 percent of foreign profits earned by domestic corporations from domestic taxation, with few restrictions. While Estonia’s tax system is unique in the OECD, the other top countries’ tax systems receive high scores due to excellence in one or more of the major tax categories. New Zealand has a relatively flat, low-rate individual income tax that also exempts capital gains (with a combined top rate of 33 percent), a well-structured property tax, and a broad-based value-added tax. Latvia, which recently joined the OECD, has a relatively low corporate tax rate of 15 percent, speedy cost recovery, and a flat individual income tax. Switzerland has a relatively low corporate tax rate (21.1 percent), a low, broad-based consumption tax, and a relatively flat individual income tax that exempts capital gains from taxation. Sweden has a lower-than-average corporate income tax rate of 22 percent, no estate or wealth taxes, and a well-structured value-added tax and individual income tax. For the fourth year in a row, France has the least competitive tax system in the OECD. It has one of the highest corporate income tax rates in the OECD (34.4 percent), high property taxes, an annual net wealth tax, a financial transaction tax, and an estate tax. France also has high, progressive individual income taxes that apply to both dividend and capital gains income. In general, countries that rank poorly on the ITCI levy relatively high marginal tax rates on corporate income. The five countries at the bottom of the rankings all have higher than average corporate tax rates, except for Poland at 19 percent. In addition, all five countries have high consumption taxes, with rates of 20 percent or higher, except for Chile at 19 percent. Since last year, several countries’ tax codes have undergone notable changes that have impacted their rankings. Table 2, below, shows both the rank and score changes for each country from last year and 2015. Austria substantially reduced the complexity of its VAT as measured by hours spent on compliance, which helped drive an improvement from 16th to 13th. Chile continued the implementation of its 2014 Tax Reform Law, increasing the top corporate rate from 24 percent to 25 percent (rising to 27 percent in 2018) and creating two separate corporate tax systems, an attributed income system and a partially integrated system. Net operating loss carrybacks have also been eliminated. As a result, Chile fell three places, from 29th to 32nd. The Czech Republic amended its income tax law to allow the deductibility of tax losses from the sale of shares by nonresidents, and compliance hours fell significantly for both corporate and individual income taxes. These changes drove an improvement of four places, from 13th to 9th. Greece raised its VAT rate one percentage point, to 24 percent. The top individual income tax rate rose from 50 to 55 percent, while the capital gains tax increased from 15 to 25 percent. The country’s dividend withholding rate increased from 10 to 15 percent. The corporate tax rate is scheduled to decline from 29 to 26 percent in 2019. Because other countries with low rankings on the ITCI also adopted changes which hurt their scores, Greece did not decline in ranking. Hungary converted its two-rate corporate tax, with a top rate of 19 percent, into a 9 percent flat tax. This rate reduction resulted in an improvement of three places, from 23rd to 20th. Israel fell one spot, from 25th to 26th. That was driven by the introduction of a “patent box,” which provides a special rate of 6 percent on profits attributable to patents. Japan reduced the amount of losses that can be carried forward to subsequent years, ratcheting the cap down from 80 to 55 percent. However, compliance time declined substantially across all tax categories, and Japan expanded its treaty network, leading to an improvement of four places, from 26th to 22nd. Latvia capped net operating loss carryforwards at 75 percent of losses and its VAT base shrunk, leading the country to slip one place, from 3rd to 4th overall. Luxembourg cut its statutory corporate income tax rate from 21 to 19 percent, leading to an overall corporate tax rate of 27.08 percent, down from 29.22 percent (taking surtaxes and municipal business taxes into account). At the same time, however, the minimum net wealth tax increased and net operating loss carryforwards were limited to 17 years. Despite the latter changes, the lower corporate rate drove a two-spot improvement, from 7th to 5th. In the Netherlands, the implementation of the 2017 Dutch Tax Package brought modest increases in individual income and dividend tax rates, which contributed to a modest slide, from 6th to 8th overall. The Slovak Republic reduced its corporate income tax rate from 22 to 21 percent. However, the country now taxes foreign-earned dividend income at a rate of 35 percent for nontreaty jurisdictions and 7 percent for treaty jurisdictions. These policy changes offset, and the Slovak Republic remains 10th overall. Slovenia adopted a corporate tax increase, raising the rate from 17 to 19 percent. As a result, Slovenia slipped four places, from 14th to 18th. The United Kingdom, which determines its corporation tax rate each year, reduced the rate from 20 to 19 percent, with a larger reduction in capital gains taxation. These changes drove an improvement of three places, from 17th to 14th. Norman Gemmell, “Tax Reform in New Zealand: Current Developments” (June 2010), https://web.archive.org/web/20160429192333/http://www.victoria.ac.nz/sacl/about/cpf/publications/pdfs/4GemmellPostHenrypaper.pdf. Organisation for Economic Co-operation and Development, “OECD Tax Database Table II.1 – Corporate income tax rates: basic/non-targeted 2000-2017,” updated April 2017, http://www.oecd.org/tax/tax-policy/tax-database.htm. Due to some data limitations, some more recent tax changes in some countries may not be reflected in this year’s version of the International Tax Competitiveness Index. Last year’s scores published in this report can differ from previously published rankings due to both methodological changes and corrections made to previous years’ data. The United States has the highest statutory corporate tax rate in the industrialized world at 35 percent (39.1 percent when including the average state corporate tax rate). However, our research concludes that each new $1 in corporate investment is actually taxed at a rate of 53.6 percent. This report estimates the marginal effective tax rate (METR) for eight different types of business investment. This includes additional taxes–such as property taxes and state and local business income taxes–that businesses must account for when they decide if a new plant or piece of equipment will be profitable. It also includes taxes paid by shareholders while subtracting for depreciation allowances and pertinent tax credits. While federal taxes weigh significantly on the cost of capital, state and local taxes—especially property taxes—comprise roughly one-third of the total tax on new capital investment, according to the report. Under this methodology, the proposed 20 percent corporate rate under consideration in tax reform negotiations would lower the METR on corporate investment to 45.9 percent, a 14.3 percentage point decrease. 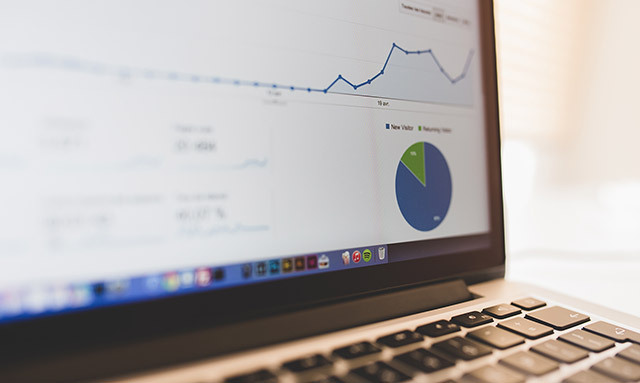 The literature on measuring the impact of tax policy on altering new business investment behavior is based on the concept of user cost of capital raised by Jorgenson (1963) and Hall and Jorgenson (1967). Changes in taxation, including but not limited to changes in the statutory corporate tax and personal income tax, would change the user cost of capital and change the impact of tax on marginal investment decisions. Marginal effective tax rates are commonly used to measure this impact. This study will show how Tax Foundation’s Taxes and Growth (TAG) model measures marginal tax rates on different capital investment. Corporate and noncorporate businesses, the two main business sectors specified in the TAG model, have different equations for service price since the tax regimes vary by sector. To illustrate how the service price is calculated in the TAG model, we begin with a cash flow statement of business receipts for noncorporate capital expressed as in equation (1). The gross after-tax return for all noncorporate capital can be expressed as tax-inclusive business income subtracting all taxes. Taxes under consideration in this study include federal business (corporate or noncorporate) income taxes, the federal gift and estate tax, as well as all kinds of taxes at the state and local level, such as property taxes, business income taxes, and gift and estate taxes. where Snc is the service price for noncorporate capital; K is the capital stock in the noncorporate sector; is the real after-tax return of rate; te is the combined federal and state estate and gift tax rate; tp,nc is the property tax on noncorporate capital assets at the state level; δ is the rate of economic depreciation; and z is the cost reduction from tax depreciation deduction allowances and investment credit (if any). That is, (1-z) is the remaining cost of the assets after tax deductions and credits. where i is an indicator for capital asset i; itc is the rate of any investment tax credit taken against all capital assets; tnc,f is the noncorporate income tax rate at the federal level; zi,f is the net present value of cost recovery for asset i at the federal level; and tncs and zi,f are the corresponding values for the state level. The term tnc is combined business income tax rate at the federal and state level and can be expressed as . Unlike the noncorporate sector, the corporate sector has a second layer of taxes: the shareholder tax on capital gains and dividends. Therefore, the rate of return for the corporate sector needs to be grossed up to cover the additional individual taxes. where tic is the combined federal and state personal income tax rate on corporate income; tp,c is the property tax on corporate capital assets at the state level; tc,f is the corporate income tax rate at the federal level; zi,f is the net present value of cost recovery for asset at the federal level; tc,s and zi,s are the corresponding values for the state level. The term tc is the combined corporate income tax rate at the federal and state level and can be expressed as tc = tc,f +tc,s(1 – tc,f ). The weighted average marginal tax rate is a summary measure of the tax burden across all assets under the user cost of capital framework. It is the difference (tax wedge) between the real pretax and after-tax user costs observed in the real world, divided by the real pretax user cost. That is, the TAG model calculates the marginal tax rate as the difference between the real pretax user cost (= service price net of the economic depreciation rate) and the real after-tax rate of return, measured as a percent of the pretax user cost. Table 1 is the calculated marginal effective tax rate across different types of capital assets. It is worth noting that corporate capital assets face higher taxes than noncorporate capital assets. On a weighted average basis, new corporate investment faces a marginal effective rate of 53.6 percent, while noncorporate capital investment faces a marginal effective rate of only 39.1 percent. The large difference can be explained by the two layers of taxation levied on the corporate returns. Apart from reducing the statutory rate on corporate income, speeding cost recovery for capital investments to encourage business to invest more is another well-researched component of fundamental business tax reform. Compared to current law, full expensing of capital investment (immediate write-off instead of depreciation) would reduce the weighted average marginal effective tax rate for corporate assets by 15.5 percent, and reduce weighted average METR for capital assets in the noncorporate sector by 4.4 percent (see Table 3). The marginal tax results are impacted by different business tax provisions, both at the federal level and at the state and local level. To focus on the role of federal tax policies only, we recalculate these METRs by zeroing out all state and local taxes impacting service prices while fixing the rate of return for capital investments. Table 4 shows the METRs due to federal taxes only. On a weighted average basis, the numbers are 36.1 and 26.8 percent for corporate and noncorporate respectively, or around 30 percent lower than the combined federal, state, and local baseline level, which indicates that ignoring state and local taxes in calculating METRs would distort the picture considerably. This study demonstrates how Tax Foundation’s TAG model calculates the weighted average METRs for different capital assets in the corporate and noncorporate sectors. The high marginal rates of up to 53 percent in the corporate sector illustrate why there is an urgent need for business tax reform. Data for the corporate sector in the TAG model includes both C corporations and S corporations. Due to data constraints from the Bureau of Economic Analysis, we cannot separate C corporations from their data report on corporate. As more details about the forthcoming tax reform bill emerge, one compromise appears increasingly likely: repealing the deduction for state and local income and sales taxes, but retaining the deduction for property taxes. In the past, we’ve explored the implications of the repeal of the state and local tax (SALT) deduction in full, but what would a property tax deduction look like on its own? Here are five implications of retaining the property tax deduction. 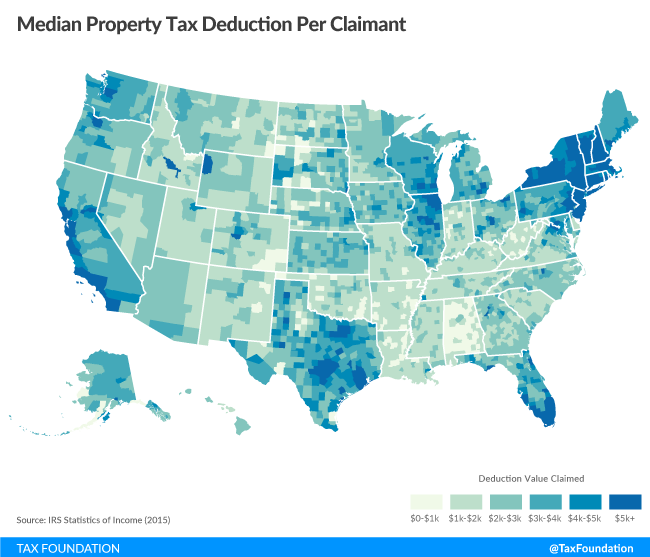 First, it would be much smaller than the current SALT deduction: the property tax deduction accounted for just over one-third (33.9 percent) of all state and local taxes deducted in 2015, the most recent year for which data are available. Second, it strongly benefits the middle class. Whereas the SALT deduction as a whole favors high-income earners disproportionately (since the federal income tax is highly progressive), the property tax component provides a larger deduction, as a share of adjusted gross income, to middle-income earners. This makes sense, as (1) property taxes lack progressive rate structures and (2) while those with higher incomes also have larger property holdings, the value of property doesn’t scale with income. A household earning ten times the median income is unlikely to own property worth ten times the median amount. As a percentage of AGI, households with incomes between $25,000 and $50,000 claim only 29 percent of what households with incomes above $500,000 claim on the SALT deduction as a whole (2.1 vs. 7.1 percent of AGI), but their property tax deduction actually represents a 20 percent larger share of AGI (1.3 vs. 1.1 percent of AGI). The deduction as a share of income is most generous to middle-income families, unlike the full SALT deduction. Third, it does not penalize low-tax states the same way that the full SALT deduction does. Under the current system, itemizers can deduct property taxes as well as either income or sales taxes. Itemizers in the nine states which forgo a wage income tax would currently take the sales tax deduction, which is generally estimated on IRS worksheets rather than relying on actual receipts. This approach tends to be less generous, and of course income tax burdens are usually higher than sales tax burdens, so residents of states which forgo an income tax are generally net losers under the current regime. The effect is most pronounced in a state like New Hampshire, which taxes neither sales nor wage income, or Alaska, which only has local option sales taxes. Still, even states which impose all of the major taxes are often net losers, as the state and local tax deduction redistributes money from lower-income filers, particularly those in low-tax states, to higher-income individuals in high-tax jurisdictions. The property tax component on its own, though, looks rather different. Property taxes are a major source of local revenue in all states. Suddenly, a state like Texas has a deduction as a percentage of AGI that is above the median. Under the full SALT deduction, Texas’s deduction is less than half the median. A quarter of all filers (25.1 percent) take the property tax deduction, slightly less than the 29.6 percent of filers who take any portion of the SALT deduction. Fourth, some states and localities continue to benefit disproportionately from a scaled-down, property tax-only deduction, just as they do under the broader provision. The majority of the value of the property tax deduction, like the state and local tax deduction as a whole, flows to a small number of states. Just six states (California, New York, New Jersey, Texas, Illinois, and Florida) claim more than 50 percent of the property tax deduction. In twenty-five counties, the property tax deduction is worth 4 percent of AGI or more, led by Putnam and Rockland Counties in New York, each at 5.5 percent. Of these top counties, sixteen are in New Jersey, seven are in New York, and two are in Illinois. At the other end of the spectrum are counties—generally low-income and low-population—where the deduction’s value is negligible or even non-existent. 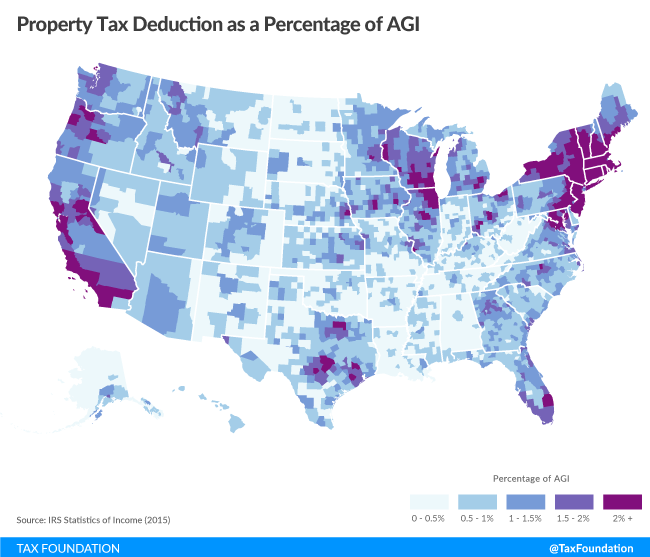 The median value of the deduction by county is 0.8 percent of AGI. In Westchester County, New York, the property tax deduction alone is worth $5,548 per filer and $15,033 per deduction claimant. Among all counties, however, the median value per filer taking the deduction is a far more modest $2,333. The interactive county map below allows you to toggle between the property tax deduction as a percentage of AGI and the amount per filer claiming the deduction. Static versions of these maps can be found here and here. Fifth, retaining the property tax deduction leaves a lot of revenue on the table, as it is worth about one-third of the $1.8 trillion (or $1.7 trillion on a dynamic basis) “pay-for” the repeal of the state and local tax deduction would provide over the ten-year revenue window. Although it lacks the highly regressive features of the broader SALT deduction, and distributes benefits more broadly across states, it still represents a subsidy to taxpayers in higher-income and higher-tax jurisdictions. The property tax, even more than other forms of state and local taxation, generally pays for highly localized public expenditures—schools, roads, police and fire protection, utilities, parks, and other local amenities—for which subsidization by less affluent jurisdictions makes little sense. On the other hand, it is sometimes argued that a large proportion of local government expenditures represent investments in human and physical capital that would be deductible as capital expenditures under an ideal tax code. To the extent that this argument has merit, it is stronger with property taxes (a chiefly local revenue measure) than income or sales taxes. If Congress is to adopt meaningful federal tax reform, it will require significant base-broadening “pay-fors” to pay down rate reductions and structural reform. The state and local tax deduction is an important piece of the puzzle. Saving the property tax deduction makes the math somewhat more difficult, but still leaves clear paths forward. Going further and preserving the entire SALT deduction, however, might send would-be reformers back to the drawing board. North Carolina made headlines in 2013 when it passed its comprehensive tax reform package. By lower tax rates and broadening bases, North Carolina jumped from 44th to 12th on the State Business Tax Climate Index. The state implemented additional reforms in 2015, pushing its ranking even higher to 11th on the State Business Tax Climate Index. And the state is continuing this momentum. In the state’s recently adopted budget, the Tar Heel State plans to adopt even more tax reforms in 2019. The budget, passed over Governor Roy Cooper’s veto, includes several large tax changes. Individual Income Tax: In 2019, the individual income tax rate would decrease from 5.499 percent to 5.25 percent. Standard Deduction: The standard deduction would increase in 2019. For single filers, the deduction would increase from $8,750 to $10,000, while married filers would see an increase from $17,500 to $20,000. Corporate Income Tax: Also in 2019, the corporate income tax rate would fall from 3 percent to 2.5 percent. Franchise Tax: Effective 2019, S corporations would face a lower franchise tax liability. S corporations would pay a flat $200 on their first $1 million in value, instead of 0.15 percent. The 0.15 percent rate would apply to any firm’s taxable value above $1 million. The franchise tax for C corporations is not impacted. The plan also includes a few changes to the state’s child tax credit and the sales tax treatment of mill machinery. These changes continue the long-term changes in North Carolina. The top marginal income tax rate in North Carolina was 7.75 percent. By 2019, it’ll have fallen to 5.25 percent. At the same time, the standard deduction has grown from $6,600 for married filers in 2012 to $20,000 in 2019. The corporate income tax rate will have fallen from 6.9 percent to 2.5 percent in 2019. Unfortunately, these changes, when implemented, won’t increase North Carolina’s official score on the State Business Tax Climate Index. The state’s ranking of 11th is very difficult to improve upon, but the state should be applauded for continuing its positive, pro-growth tax changes. 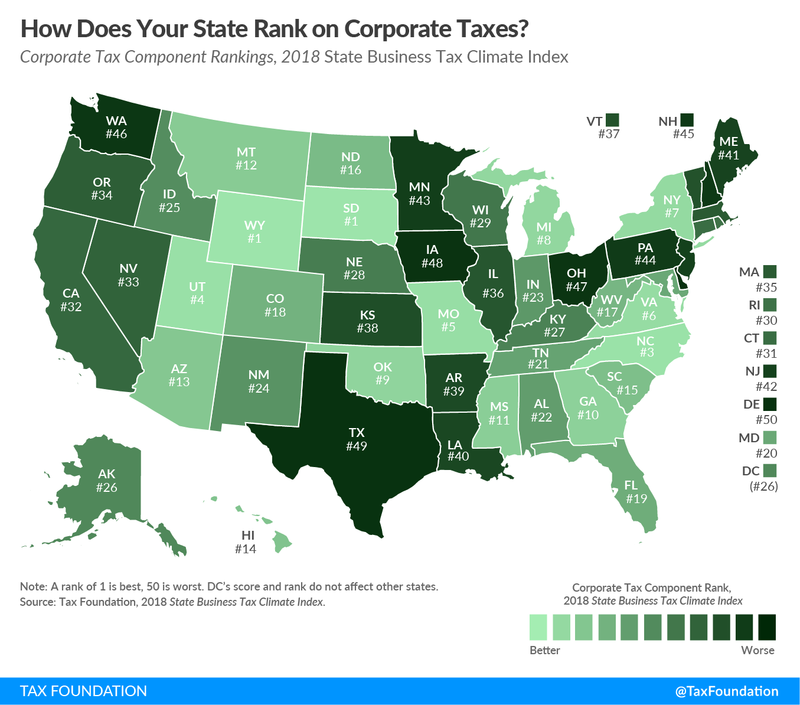 In the coming weeks, we will break down our recently released 2018 State Business Tax Climate Index with several maps illustrating corporate, individual, sales, property, and unemployment insurance tax rankings. Today, we look at corporate taxes. The corporate tax component of our Index measures the impact of each state’s principal tax on business activities and accounts for 19.0 percent of each state’s total score. Unlike other studies that look at overall tax burdens, the Index focuses on the structure of each state’s tax system. Our corporate tax component, for example, scores states not just on rates and brackets, but on how well they handle net operating losses, whether the state levies an economically harmful gross receipts-style tax, and whether a state indexes its brackets to inflation, among other things. Click the map below to launch an interactive version of our corporate tax rankings, including a detailed landing page showing how your state compares. 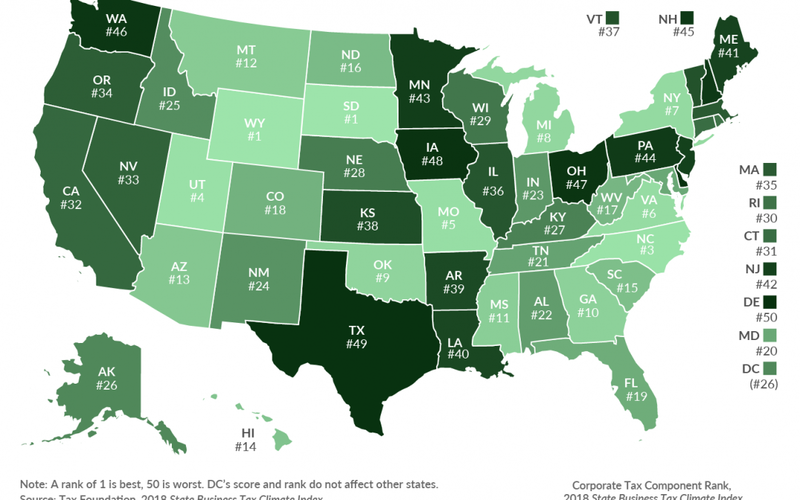 The table below shows detailed corporate tax scores and rankings for each state from 2015 to 2018, as well as component rank and score changes since last year. To learn more about how we determined these rankings, read our full methodology here.